MOSHI MOSHI NIPPON FESTIVAL 2018 in SHIBUYA will take place in Harajuku & Shibuya on Saturday March 24 and Sunday March 25. The festival will take place in 4 main areas. One of them is SHIBUYA CAST which is where we will hold the MOSHI MOSHI NIPPON MARKET where you can enjoy Japanese food while taking in the cherry blossom scenery. Maid café group Maidreamin will also appear at the market. With that in mind, Ren Koseki dropped by the café in Shibuya to see what they’re all about. Maidreamin has recently become popular with female customers too who pop in for the maid experience. Ren had her fill by trying their great food, watched a live performance and got involved in dressing up. 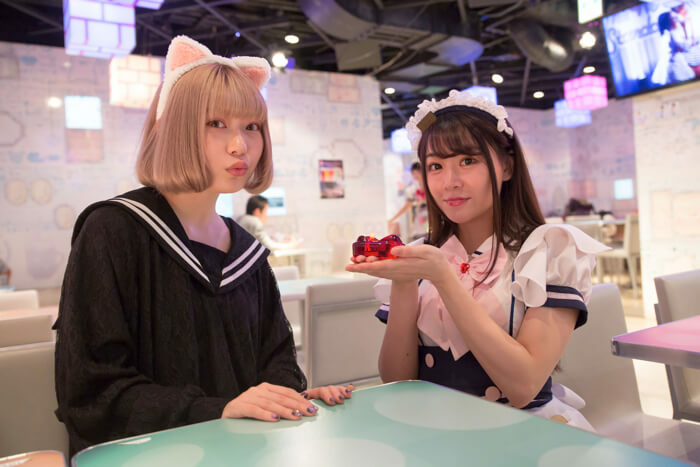 Maidreamin offers an experience like no other, taking on the concept of a “dream country littered with ‘moe’ and ‘kawaii’ for all customers who enter.” This is expressed in many ways as expected from a dream country. When you enter the café, it’s said that you’re entering the country. Upon entering, you are greeted, and a ceremony is held to welcome you into the country. When you blow on the candle and it lights up you become a goshuin-sama (master) if you’re male or ojou-sama (lady) if you’re female. Animal ears will ‘sprout’ from the top of your head when you enter the Maidreamin country as you’re given an animal Alice band to wear. 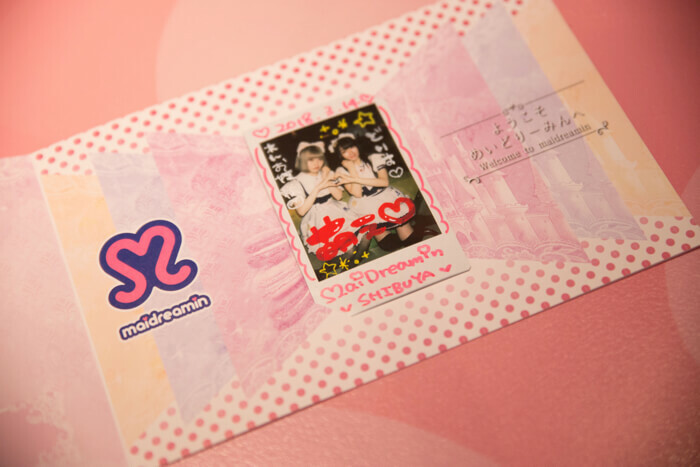 All food and drink items on the menu come with either a Maidreamin ‘omajinai’ service or a drawing performance. Omajinai is when you chant a spell together with a maid to make your meal even tastier. Be sure to try chanting “oishikunaare, moe moe kyun♡” (“abracadabra, become delicious♡”) together with your maid. Those who want even more fun should get the “LOVE Kakuteriimin” (\1,240). A maid will call your name while making a cocktail right in front of you and put on a truly moe performance. It’s recommended for friend groups and work colleagues. Ren ordered strawberry milk. You can order from either a non-alcoholic and alcoholic menu. The menu is so plentiful you’ll keep saying “cute” without even thinking. 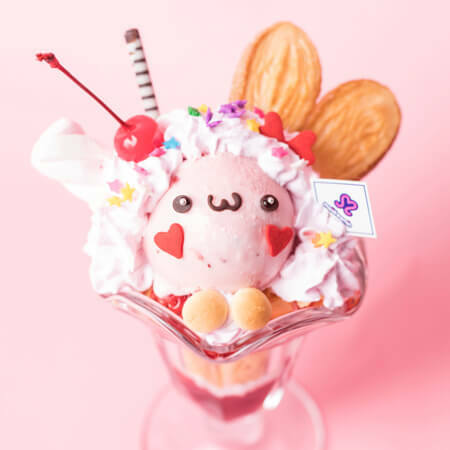 You can of course omurice, a classic maid café dish where you can request a maid to draw something on it, as well as the animal parfait which was just updated at the end of February. It’s proven popular with overseas influencers and girls in Japan for its cute appearance, delicious tasty and amount. Friends get together to each order the Bear (chocolate banana), Cat (vanilla), Dog, (tea), Panda (matcha) and Rabbit (strawberry) parfaits and take a group photo. This is the \880 “Mori no Kokage no Usa-chan Parfait” (Bunny Under the Forest Bower Parfait). You can get a “Sakura Float” to go with the parfait (\1,100. Comes with the maid omajinai). We really want you to try it! Ren has actually been to Maidreamin before. 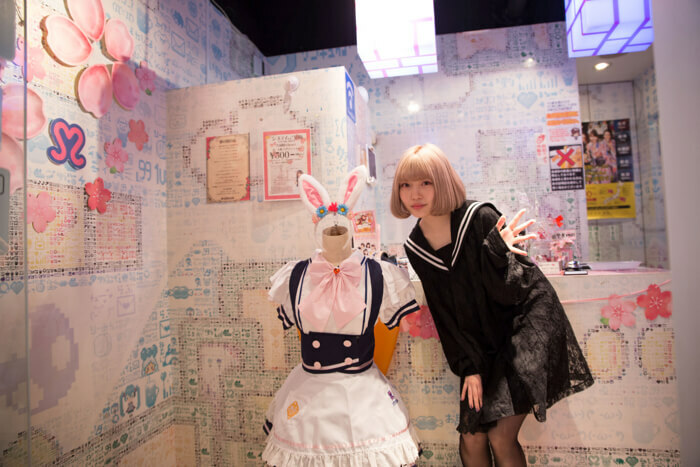 She had been wanting to try on the maid outfit again, so she transformed into a maid with “Magical Change” (\3,240), a popular original Maidreamin maid outfit that you can wear at the café. Among the maids there are 3 different outfits: “Training,” “Original” and “Dream Outfit”. Only a select few can wear the Dream Outfit. It’s a yearned for uniform whose wearer is known to have gone through the most strict and demanding reception training in the maid café industry. Only famous and successful applicants can wear it. After changing into your maid outfit, take a commemorative chekki photo (\800). When taking a photo on stage where the maids perform live you can get a nice photo album and a maid will draw on the photo for you. It will encapsulate your time in the country! Maidreamin has many overseas fans, so much so that they received an offer to perform the song for Anime Expo 2017 which is held in Los Angeles every year. If you order from the ‘Live Menu’ you can see them perform live too. Look out for the ♪ badge on maids’ uniforms. 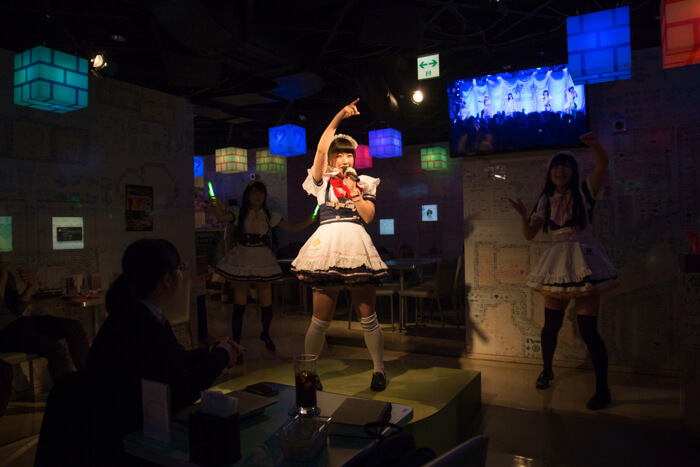 This will tell you if they are a maid that performs live and who has a repertoire of over 10 songs they can perform. Shiorin gave an energetic performance for Ren. 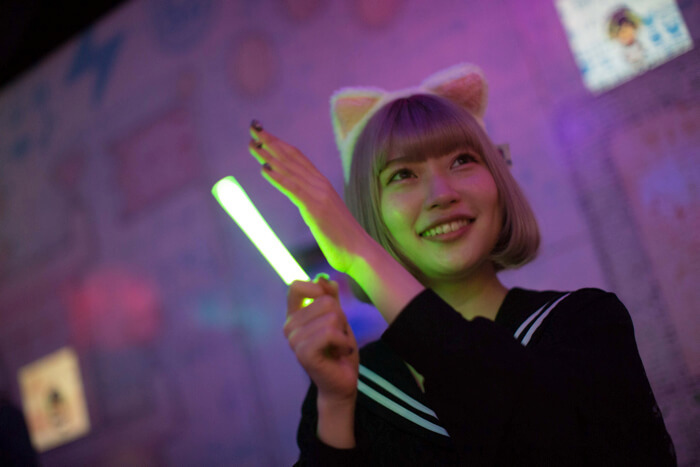 Those who want to have even more fun with the live show can buy a “Magical Stick” penlight. 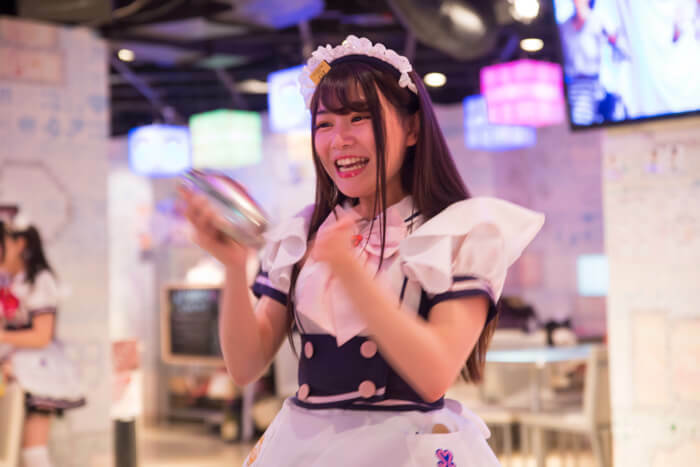 If you hand over your penlight to a maid that’s off stage, they might even dance otagei for you with the penlight, a type of choreographed dance performed by fans at idol shows! 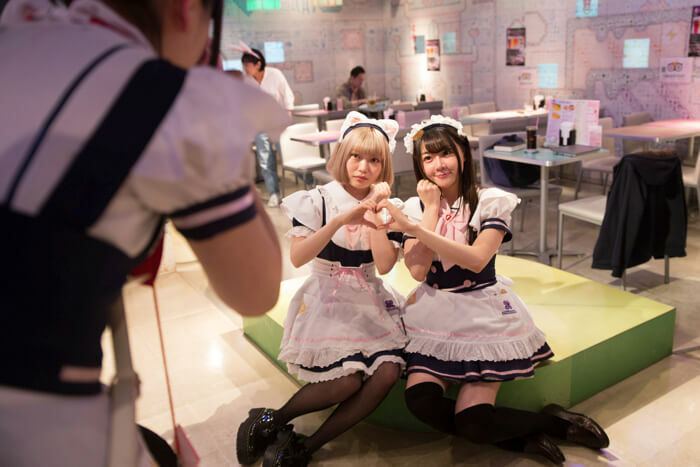 All of the maids at Maidreamin can perform otagei, making it the only maid café where all the maid staff can do it. During the MMN Festival, you can catch popular Maidreamin maids including Dorisu, who gave Ren the welcome ceremony, as well as Hinata and Amo on the live stage at Onden Shrine on Saturday March 24 at 13:30-14:00. Hinata is a member of Moe Kami 8, a group formed by popular members of the maid café. The three of them will perform together with the top 17 maids of maid idol unit QSCS, who have over 450 members. The services below are scheduled for the Maidreamin booth at MMN Festival 2018. 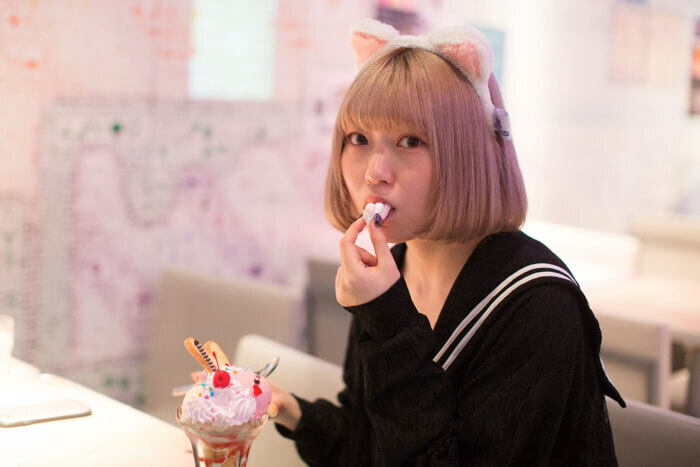 Since the maid dress-up time is different from the café’s normal time, this is your chance to enjoy eating a parfait and more while dressed as a maid, something you normally can’t do. This is a must-do for both first timers, regular customers and cosplayers alike.